Past principal performers from Les Misérables, present a blockbusting two hour show! Recreating original West End/Broadway musical hit songs with amazing authenticity, Beyond the Barricade has a nationwide reputation for quality and perfection in musical theatre and has received critical acclaim across the UK and abroad. Starring Andy Reiss, David Fawcett, Katie Leeming and Rebecca Vere, together with their own ensemble of talented musicians, Beyond the Barricade features songs from The Phantom of the Opera, Jesus Christ Superstar, The Jersey Boys, The Lion King, Blood Brothers, Miss Saigon and many others, climaxing with a spectacular finale from, of course, Les Misérables! Andy Reiss and David Fawcett devised Beyond the Barricade after appearing in the Manchester and London casts of Les Misérables. David played the lead role of Jean Valjean in both of these productions, and Andy played most of the male characters, including Enjolras and Valjean, and still remains the only person to take on the job of being the shows Resident Director, and perform in it at the same time. Also on stage is Katie Leeming, who joined Beyond the Barricade after playing the lead role of Eponine in the West End production of Les Misérables, and Rebecca Vere who played Cosette in Les Misérables. 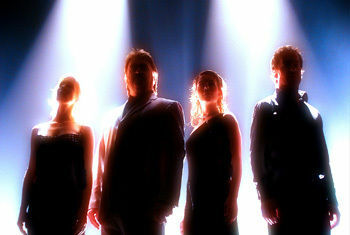 Andy, David, Katie and Rebecca also featured in the Les Misérables 25th Anniversary Concert, staged at the O2 Arena, London.